no big dill: Sprout Hooray! First of all, thank you for all your suggestions on encouraging the French learning chez nous! I'm excited myself to brush up on my French and to help Divine down this road. I'll let you know how it goes, but right now we're going to finish up the book she has, start doing some pen pal exchanges, watching some familiar movies in French, and go from there. I'm thrilled! There were some great suggestions that I will be coming back to. Merci beaucoup!! I went to have my glucose test [for gestational diabetes] last week. I wasn't worried. One of the [many] reasons I love going to a midwife is that you don't have to drink that syrupy orange gloop and then sit there for an hour so you can give a vial of blood to be tested. All I did was eat a normal breakfast with a certain amount of carbohydrates at home and go in two hours later for a finger prick. I passed! I'm going to uP my sprouting, which is another source of iron and I have put together a simple how-to kind of post for those who expressed interest. So, what is sprouting, you ask? It is the awakening of a dormant seed. By simply adding moisture, the seed begins the process of sending out shoots in order to become a thriving plant. WHY would we want to sprout a whole bunch of seeds at the same time? When a seed is sprouted, it has an explosion of nutrients to supply itself in order to grow and thrive, some vitamins increase from 30-6000 times! Sprouts are great to have in your food storage or emergency kit because when you can't run to the grocery store for a prolonged period of time for some greens, sprouts are a quick and easy way to provide those needed nutrients in your diet. WHAT can you sprout? So many different seeds/legumes used to grow food [alfalfa, clover, arugula, cress, radish, fenugreek, mung beans, garbanzo beans, peanuts, lentils, peas, adzukis, broccoli, radish, mustard, wheat, spelt, buckwheat, rye, kamut, quinoa, amaranth, barley, oat, sunflower, pea shoots, almonds, pumpkin, garlic, leek, onions, should I go on? ], but you don't want to run to Home Depot and grab a few seed packets. Planting seeds are normally treated with chemicals which aren't as harmful when grown into produce, but not a good idea when popped into your mouth, or used in cooking. They should be organic and meant for consumption. 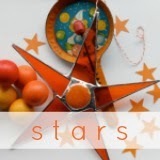 All sprouts, just like vegetables, have a different flavor, so it's fun to try different seeds and find what you enjoy. Some seeds can be sprouted, but should just be used in cooking, like black beans. WHY would you sprout something before cooking it? Like I said, the nutrients explode when you sprout them, so you are eating even more healthfully than cooking them straight from the package. So, let's begin. Just like there are lots of different seeds to sprout, there are lots of different ways to sprout. Most likely you have things on hand already to start today! The first step is soaking. 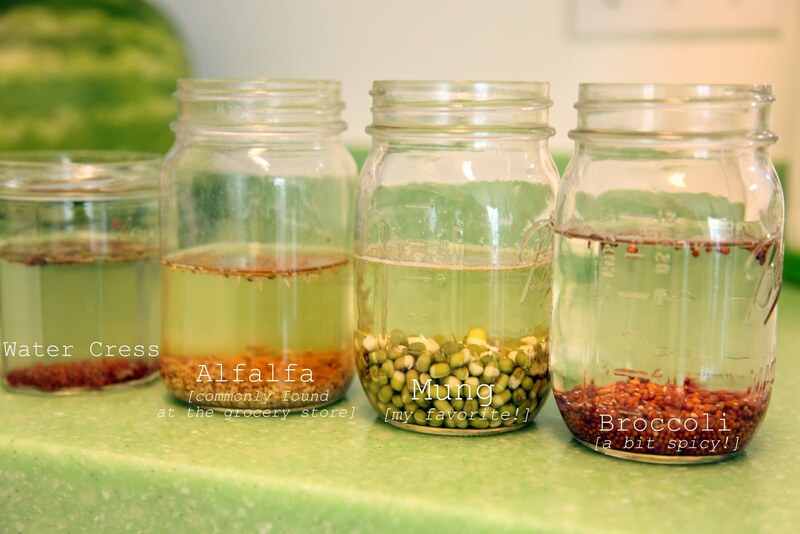 Fill a jar 1/4 full or less with your seeds and plenty of water. They expand amazingly--I overfilled a jar with garbanzo beans and they didn't rinse properly the next day because they were too packed and went sour, so give 'em some space. Let them soak over night. The next morning: If your seeds are teeny tiny, use a single layer of cheese cloth and rubber band to drain and then rinse the seeds so you don't just dump them out and down the drain. With mung beans and peas, I just use my hand to keep them from falling out. Drain as much water as you can. You want them moist, but not soupy. If you have an ultra bright kitchen with a window right next to your sink, you should put your sprouts in the cupboard. I keep mine on the counter throughout the whole process because I only have one window across the room in the kitchen, and I haven't found it makes a huge difference, but from what I've read, that's technically what you're supposed to do. 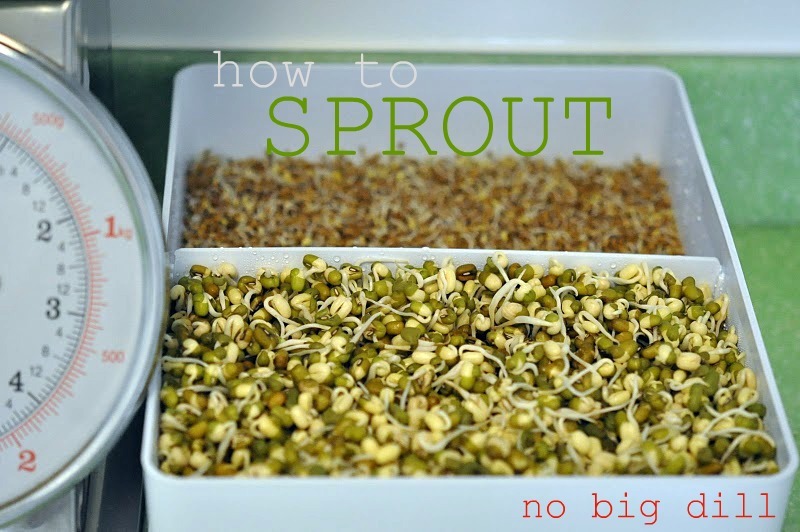 If you use a sprouting tray, there's not an issue since the light won't penetrate the tray. I would forget about my sprouts if I put them in the cupboard anyway ;). Rinsing them throughout the day is what keeps them sweet. 3 times is probably sufficient, but I just tend to rinse them whenever I'm standing at the sink. Drain the water well. TASTE your sprouts periodically as soon as the shoots emerge. They change flavors as they mature and you may find you like them better at one stage than another. 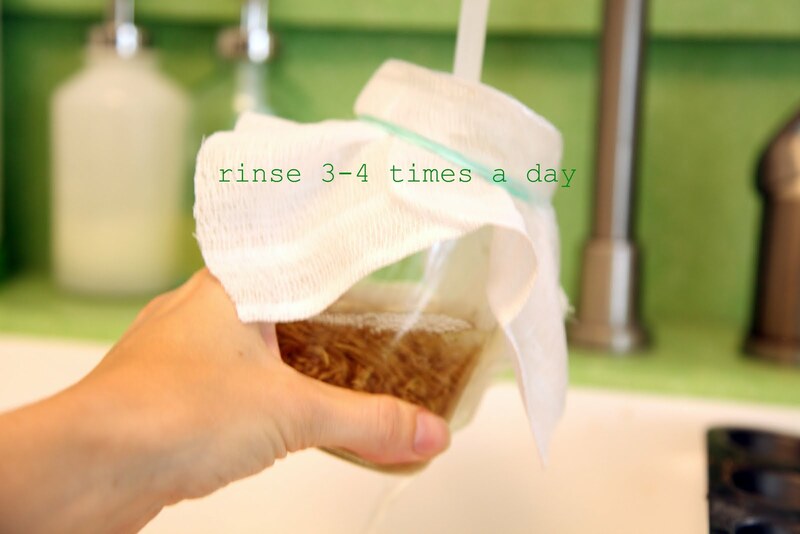 Once they've reached the desired length after 2-3 days, dry them completely on a paper towel and store in the fridge in a container for 3-5 days. I mentioned using a sprouting tray which works the same way as a jar, except they're spread in a layer, have built in drainage, and you don't have to use cheese cloth. They are very handy, especially for smaller seeds, but a jar works just fine if you don't want to spend the money. I've also read that you can do this with a fabric bag, but that makes it difficult to harvest the sprouts. It would come in handy if you're into camping and want to take your sprouts with you, though! There are also tube sprouters and automatic sprouters which I don't have any experience with, so I can't really expound on those. I just stick to a jar. WHERE can you buy the supplies? Most grocery stores carry common seeds such as a variety of beans, lentils, wheat, spelt, quinoa, buckwheat and even mung beans. Natural food stores often carry them in the bulk section, and are usually organic. You can also order them online from places like Park Seed. The most comprehensive resource I've found is www.sproutpeople.org. They not only have a huge amount of seeds available, but they give you the nutritional information, have multiple types of sprouters, and a great collection of recipes, including, get this, DESSERTS with sprouts. I don't do a huge amount of cooking with sprouts, although I'd like to start doing more. I just mostly keep them on the counter as a snack that's easy to grab and very nutritional. Ryan loves them and my kids are even starting to snack on them and add them to their sandwiches and tostadas. Nice. Last night Azure said she added them to her taco, just like the adults. See? It's not so difficult! As a disclaimer, I am not an expert on sprouting. This is just what I've learned and what works for me. If you have something extraordinary or something ordinary to add about sprouting, feel free to do so in the comment section, as I am always ready to learn more! Thanks for the sprout info, Katy! I had low iron with one of my babes and a lot of iron-rich things were hard on my stomach. Cream of Wheat is pretty rich in iron and it worked for me! Best of luck! So excited for you and your sweet family! Cream butter and sugar. Add molasses, then egg, and mix well. Sift dry ingredients together and add to butter mixture. Stir well. Roll dough into 1 inch balls. Roll each ball in sugar and place on baking sheet. Bake at 375 deg. for approx. 8 minutes (depends on oven). Cookies should be crisp around edges, but soft in the middle. Enjoy! 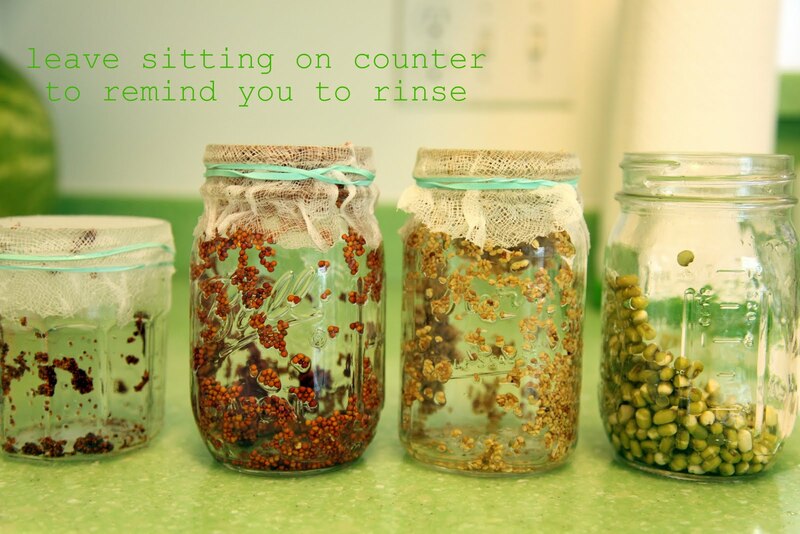 I really want to give sprouting a try but I'd probably forget to rinse them enough. Beets and spinach are a good option too if you like them. Vicky--that's why I leave mine next to the sink so it's pretty much impossible to forget! I always have low iron and take supplements, but when I need a quick boost Almonds, Graham Crackers, and fruit and grain bars (like nutri-grain) make for quick snacks. Almonds and crackers run 6%DV for tiny servings and bars are 10%. Not as nutrient packed as your sprouts maybe, but if you crave a different flavor it might help. Good Luck! I love sprouts and use to make them years ago. Time to get back at it! Thanks for the info! We've found we love egg rolls and rice dishes with sprouts and it would be nice to try them ourselves. Spinach is really high in iron, you could try making a smoothie with spinach and a mix of purple berries. There's lots of recipes if you google 'green smoothie' but I like the purple berries because they fight back the green color, which might be hard to get over, haha. Iron vitamins are sooo hard on the digestive system! Blech! I hope you can manage to add enough extras to up your iron without! 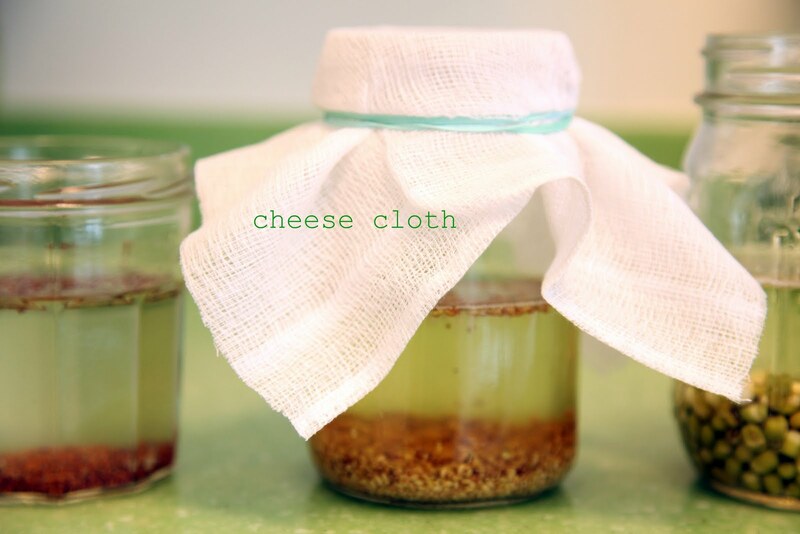 I will be trying this with a jar and cheesecloth.....I have one of those sprouter thingys with multiple levels, but this looks so much easier!! Thanks for the sprouting info!! I am going to try it! I cook with cast iron cookware, which is *supposed* to give food up to 10mg of iron during the cooking process. Good luck! Sprouting has been on my mind for weeks! Thank you so much for posting this helpful info! Thanks for the knowledgeable post on sprouting! I think I would like to give it a shot. It seems like a fun one to get kids involved with too. Thanks Katy. Have you ever tried Dill sprouts? Other than the 5 already sprouting and one waiting for the right day. No joke intended, even thought they are very small I wondered if they'd work. Thanks for the sprouting info! I had no idea about sprouts and their nutrient boost. I'm definitely going to try it out. Thanks! Wow, I have seen you comment about "sprouting" before but for some reason never drew the connection to alfalfa sprouts and I am in LOVE with alfalfa sprouts!! I am going to have to try this! I hate having to buy them in the store because of how much they cost and how quickly they go bad. I am so excited! Thank you for the demo! You amaze me! Here's hoping for increased iron and an easy 3rd trimester! One other approach to getting extra iron is simply to start cooking in a cast-iron skillet. It works best if what you are cooking is at least mildly acidic (e.g. applesauce). I had very low iron after a medical issue earlier this year and my doctor recommended Total Cereal (he said it was better than almost anything). Worked like a charm. As mentioned above by at least one person, cook in cast iron. We use it for nearly everything from biscuits to stirfry vegetables. If you need any cast iron cooking tips, I'd be glad to help. It is basically all I use on the stove top and a lot of what I use in the oven. I make spinach smoothies (sometimes I even add sprouts too!). Just blend a big handful of baby spinach with some frozen fruit, a banana or some apple slices, some kind of liquid (freshly squeezed juice or milk) and maybe some Greek yogurt (I love Brown Cow vanilla). They are so good and a great iron boost. My kids love them too! Interesting! You might want to eat nori also rich in iron as well as calcium and a good source of fiber.Congrats! Thanks for the sprouting info! I tried to sprout wheat to make wheat grass and it totally didn't work, I am sure because I used the wrong kind! Just regular old cooking wheat. I love the idea of having this in food storage. Thank you all for your suggestions and recipes! I look forward to making my green smoothies and trying the other hints shared! So, I have been obsessive with ice this pregnancy? I can't get enough. It started about 2 weeks ago. Is that link to low Iron. I have been extremely tired this whole pregnancy. I guess I better ask my midwife! About the iron, I used to drink nettle tea to get my iron up when I was pregnant, worked really well. I just gave a presentation on sprouting to a group of ladies. My new favorite are sunflower sprouts; however, they do require you put them in dirt, but it's as easy as jar sprouting. Also, handypantry.com is another source for buying seeds and tends to be a little cheaper too. We tried the hummus and almond torte recipes from sproutpeople.org. The hummus was awesome and the almond torte was good, but very rich. We also made sprouted wheat bread that was amazing. Anyway, thanks for the post to get others excited about the awesome benefits of sprouting. I've sprouted lentils a coule times. I used a mason jar, ring, and a piece of screen cut in a circle to fit. 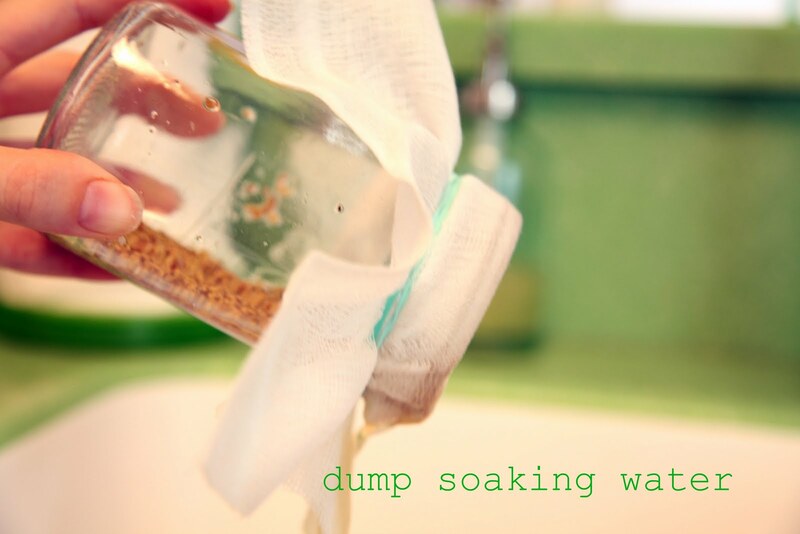 It may drain more quickly than cheese cloth and you won't lose any beans. Just a thought. p.s. I love your blog!